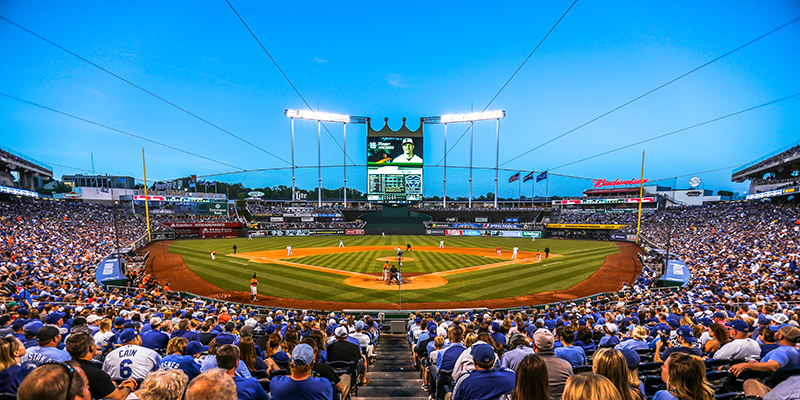 Guest blogger MeLinda Schnyder shares tips for making the most of your trip to Kauffman Stadium. My husband has seen a game in every current Major League Baseball park, and his favorite is still Kauffman Stadium, or The K. We live three hours away but regularly make day trips to see the Royals play—and several times a season we plan an overnight in Kansas City based on the Royals’ schedule. 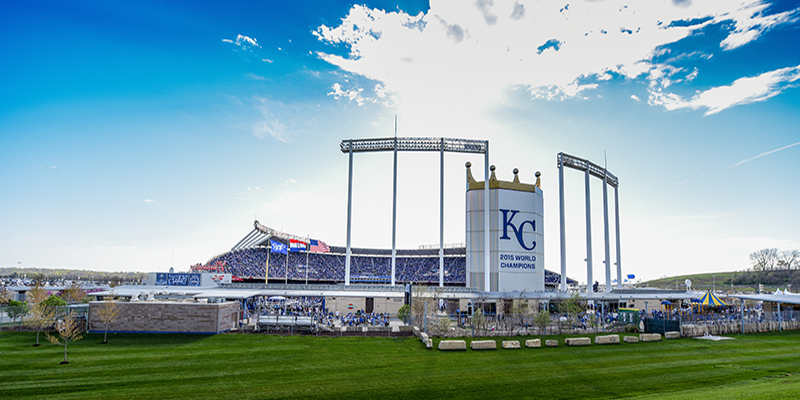 The home of the 2015 World Champion Kansas City Royals is special in many ways, from the beautiful and unique fountains in the outfield to the massive Crown Vision high definition scoreboard (the largest in the Majors) and excellent tastes of local barbecue and beer. Kansas City is a baseball town, and you’ll love the fun atmosphere even more if you know the ins and outs of Kauffman Stadium. If money is no object, opt for the Bats Crown Club seating right behind home plate. It comes with all you can eat and drink, luxury style. But really, every seat at The K has a great view of the field. When I’m looking for lower priced seats, I opt for an outfield seat instead. The good news is that there are plenty of price points within the stadium and you can take a look at the views from various seating sections before buying tickets. You can buy tickets directly from the Royals online, via telephone or in-person at the box office. The Royals have a feature called dynamic pricing that shifts the prices of tickets based on supply and demand. The Royals offer ticket discounts to military, seniors and students, plus a variety of special discount days that can be found on their ticketing website and by signing up for email notifications. One of my favorite ways to choose the game I want to attend is to look at the special Theme Nights – the ticket often comes with a giveaway like a bobblehead or a themed hat, or includes special activities, like a celebrity softball game before the Royals game. If you decide to buy your tickets at the stadium on the day of the game, you can avoid lines at the ticket counter by using the self-service ticket kiosks. Regular-season game parking is $15 for cars and motorcycles, $20 for oversized vehicles and $25 for RVs. I learned a trick on my last visit to Kauffman Stadium: more often than not, the outfield gates open before the infield gates. You can get in the stadium, experience the museum, the features in the outfield or grab something to eat or drink; you just can’t get into the main seating bowl until the entire stadium has opened—usually about 90 minutes before game time. So instead of waiting in the long lines forming at the other gates, head to the left or right field gates and spend more time inside the stadium. If you want really early access, buy an Early Bird Batting Practice ticket for $12 per person (ages 4 and up), available for select games with evening start times. You’ll get an exclusive view of batting practice from behind the dugout and you’ll get in one hour before regular gate opening times. Early Bird Batting Practice tickets can be purchased in advance at Royals.com, the main ticket office located near Gate C or the ticket windows located at Gate A (left field) 90 minutes before regular gate opening times. The Kansas City Royals celebrate their 45th season at Kauffman Stadium in 2017, and, thanks to continuous renovations throughout the years, it is aging gracefully. You’ll soon find that there is so much to do at a Royals baseball game in addition to watching the actual game! The Royals Hall of Fame Museum is included in the cost of your game ticket and is open through the top of the eighth inning. This is a really special place and should not be missed. Many MLB ballparks charge for these types of museums. The 7,000-square-foot museum in the left-field area opened in July 2009 and is much more than a plaque gallery of the 25 members of the Royals Hall of Fame. You can start in a dugout-style theater with a 15-minute film or jump straight into the gallery full of memorabilia. You’ll see the Royals’ 1985 and 2015 World Series Championship trophies, the 1980, 1985, 2014 and 2015 American League Championship trophies along with other artifacts, from Cy Young Awards to Rawlings Gold Gloves and other memorabilia from throughout Royals history. If you’ve been through the museum before, you’ll still want to visit, because exhibits change season-to-season to highlight special moments in Royals baseball. This year, exhibits include a multimedia history of the All-Star Game, 2011 rookies and Gold Glove contenders. There’s also a newly added tribute to the late Yordano Ventura, who passed away in January 2017. The exhibit includes Ventura’s jersey from his first postseason start against the Angels in 2014 and other items that honor the pitcher’s memory. The Hall of Fame museum is part of the Outfield Experience, an area developed in 2009 to provide entertainment for all ages. Behind the Hall of Fame is a kids’ area with a miniature version of The K, a base run, batting and pitching cages, five holes of mini-golf and a Royals-themed carousel. You can pay for each activity or, on Family FunDay Sunday, you can buy an all-day pass for $10 per child. Every Sunday home game, the Royals host Family FunDay Sunday with pre-game entertainment on the Outfield Experience stage, face painters, caricature or balloon artists and a pre-game Royals autograph session. After the game, kids 14 and under can run the bases on the big league field for free. From a $17 legends tour to a $350 all-access tour that includes a Loge Level seat and $50 food voucher, fans can see as much of The K as they want on an official stadium tour. The tours must be booked in advance and typically run Tuesday, Friday and Saturday from April 4 to May 31, Tuesday through Saturday June 1 to Aug. 31 and Tuesday, Friday and Saturday Sept. 2 to 30. Check MLB's Royals Tour Site for tour descriptions. Kauffman Stadium has a friendly policy for outside food and drink, but I sure wouldn’t want to miss the awesome food and drink options that I look forward to at a Royals game! They add items every year, and this year two of their new menu items were included in USA Today’s 10 craziest ballpark foods for the 2017 MLB season. Every Friday, from May through August, the concession stands offer hot dogs and peanuts for $1 each. One of the best deals in the entire ballpark is the $9 bucket of delicious buttered popcorn at Topsy’s, a long-time KC favorite. It’s a large bucket and comes with one refill. If you want more than standard ballpark fare, there are specialty concession stands throughout the park, plus two restaurants. If you’re wanting to try KC-style barbecue, you’ll find it in salads, burgers, sandwiches and more. No. 2 on USA Today’s list of 10 craziest foods for the 2017 MLB season: the pork patty melt, available at section 206. It’s a funnel cake topped with barbecue pulled pork, shredded cheese, fried onions, coleslaw and a jalapeno popper skewer. Also making that list is the Sunrise Dog, a hot dog with cheddar cheese, a fried egg and white sausage gravy available at sections 208 and 247. The stadium’s restaurants include Rivals Sports Bar in right field and Craft & Draft on the Loge Level along the third base line. You can either stop in for food and drink (seating in the main restaurant area is open to all guests, first-come, first-served) or purchase tickets for seats connected to the restaurants. Craft & Draft has more than 20 local and national craft beers on tap and another 50 bottled beers, along with a quick-fire artisan pizzeria, gastropub menu and a self-serve fountain drinks station. Rivals Sports Bar was renovated before the 2017 season and offers The 360 Vodka Bullpen Bar and a sports bar area. The open-air bar has a large HD projection screen and a dozen 60-inch televisions. The menu features items such as a grilled ribeye steak sandwich, gourmet burgers and parmesan garlic street fries, as well as milkshakes and frozen cocktails featuring a variety of 360 flavored vodkas. If this is going to be your first visit to Kauffman Stadium, your child’s first baseball game ever or any other special occasion, the Royals have a few cool ways to commemorate the event. Stop by one of the two Guest Services locations for a free and official certificate. The items come with tamper-proof holograms that include a number so you can lookup on MLB.com the documentation for your item. There are usually about 20 balls per game and they range from a double hit by Salvador Perez to a ball used to strike out a hitter or a ball thrown in the dirt by the starting pitcher. The Royals Authentics store also sells other game-used items, including collectibles autographed by current and past Royals players. A portion of all proceeds will benefit Royals Charities. The Royals have three designated areas for autograph seekers: Gate D truck gate for visiting team bus, the ramp behind player parking for Royals players and outside the Gate C lobby, behind the designated barricades. Another way to get autographs is during Signature Sundays every Sunday home game. Two Royals players will sign autographs from the top of the Royals dugout for approximately 20 minutes, beginning at approximately 11:45 a.m.
As you can see, there’s plenty to do before the excitement of the game starts. 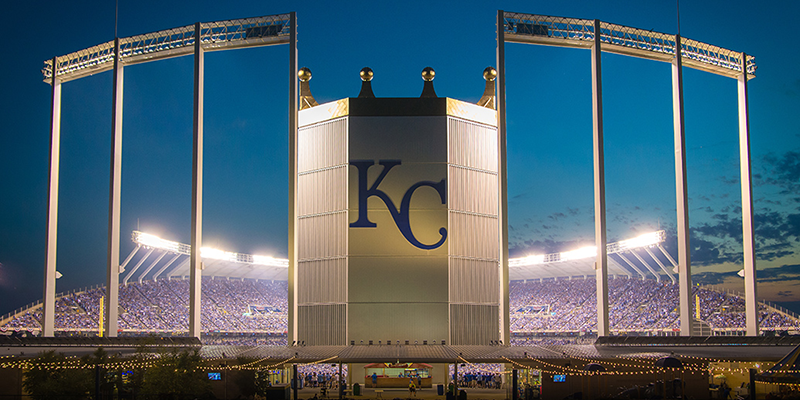 If you don’t want to miss the game, get to the ballpark early and enjoy the entire Royals experience! MeLinda Schnyder grew up in Columbia, Missouri -- putting her right in the middle of Cardinals and Royals country. Admittedly, she grew up in a Cardinals household but living in Wichita, Kansas, for the past 20 years means she's been to many more Royals games than Cards games. She blogs about travel and life at www.nextdoortonormal.com.